On a sunny Autumn day, I made an impromptu visit to Gotokuji (豪徳寺) which is said to be the Birthplace of Manekineko (beckoning cat). During the Edo era, there was a priest of a run-down temple named Koutokuin (the predecessor of Gotokuji) who was precarious about a cat and fed it some of his own portions. One day he mumbled to himself wouldn’t it be nice if this cat could usher in good fortunes. The cat sat every day in front of the main gate of the temple. One day, on an early summer afternoon, several samurai returning from deer hunting visited the temple. Despite the sudden visit, the priest received them warmly and delivered a moving and serene sermon. Naotaka Ii, one of the samurai who was the 2nd generation of feudal lord of Hikone, was deeply impressed with the priest’s hospitality, leading to his frequent visit to the temple. The priest thought it was the cat that invited the Naotaka party to the temple that faithful day. He believed his favors for the cat finally brought luck to the temple. When the cat passed, he built a tomb and prayed for the repose of the cat’s soul and for the future generations. He got an acquainted potter to make a stationary article in the shape of a cat lifting its hand and beckoning people and fortunes, named “Manekineko”. In later years, the Setagaya province came under the control of the 15th feudal lord of Hikone feudal domain, and the temple became a family temple of the Ii family, resulting in the temple flourishing. Gotokuji, as it’s now known, a temple of Sotoshu, is located at Setagaya, Tokyo. Naosuke Ii, a Chief Minister of Tokugawa Shogun, was assassinated in the Sakuradamon Incident and was buried in this temple. 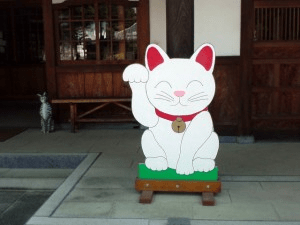 This is the famous Story of the origin of Gotokuji Manekineko Story!